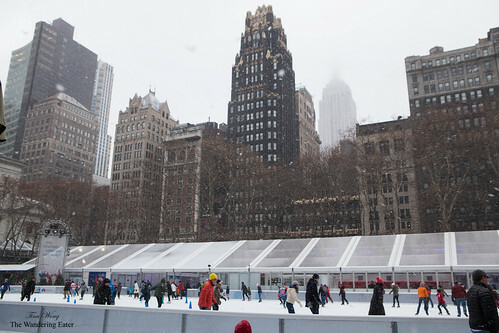 This morning was another round of snow but I was in Bryant Park’s Winter Village and skating rink to meet up and ice skate with a few friends. It feels and looks romantic in ways with the flakes floating down the sky. 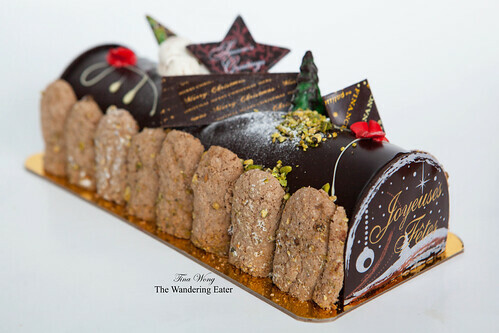 When we’ve gotten back to my house, we’ve indulged on the Financier’s modern take of the yule log, Nuit Blanche. 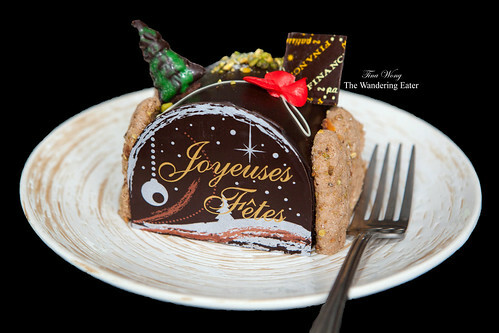 It’s composed of dark chocolate mousse on pistachio pain de gene biscuit (a Genoa-style almond cake), raspberry and pistachio mousse, chocolate lady fingers, and chocolate glaze (8.5-inch for $32.50, 12.5-inch for $45 each for all yule logs). It’s a creamy, light, not too decadent cake that’s simply delicious. 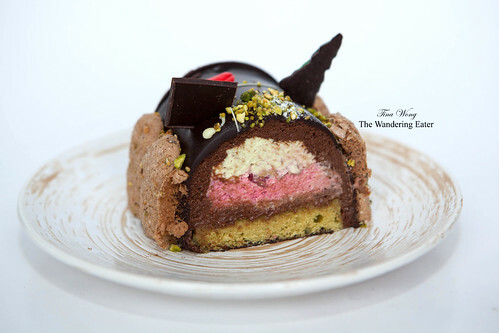 The bright, tart raspberry mousse and nutty pain de gene makes it an interesting cake and the beautiful layers make the cake look extra festive. 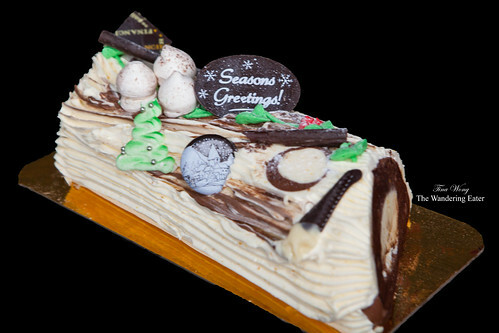 For the traditionalist, we had the Grand Marnier yule log is made of vanilla biscuit rolled with a Grand Marnier mousseline and decorated with a light buttercream. The buttercream was lightly flavored with orange to echo the lovely mousseline (essentially, a pastry cream with lots of butter). Despite the fact it’s made with lots of delicious butter, it’s not as heavy as you’d think and it helps with the aromatic orange flavors and Grand Marnier in the cake. 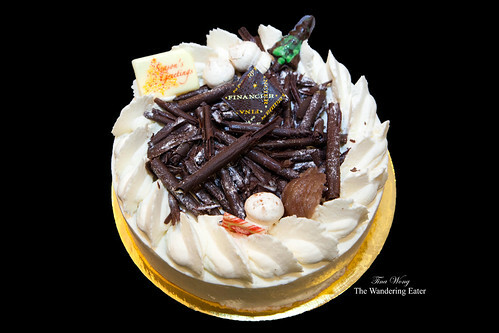 Financier’s take of the Mont Blanc is fairly straightforward (comes in a 7-inch cake for $34.50 and the 9-inch cake for $45.00). 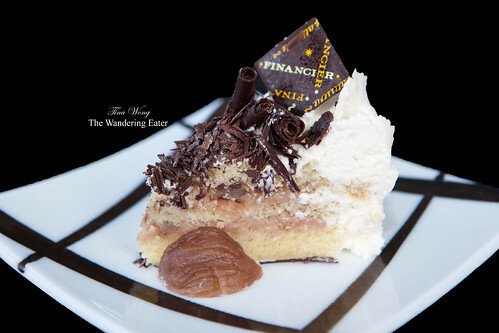 It’s filled with sweet chestnut cream, light crème Chantilly and fluffy yet moist vanilla genoise cake. It has a hint of rum topped with chocolate shavings and topped with a few marrons glaces. 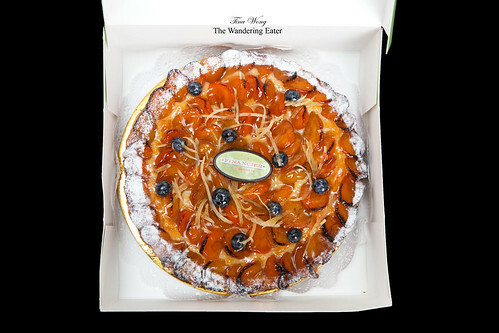 We’ve ended with a lighter, if you will, pastry of the apricot lemon tart (9-inch for $26). This is from their regular line up of delicious tarts since we wanted something much brighter and pleasantly acidic tart. Almost taste like a bite of sunshine. 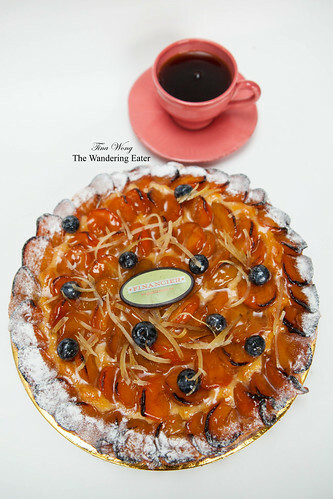 The crisp yet crumbly, buttery shortbread crust filled with slices of juicy apricots topped with an apricot glaze, strips of lemon zest and dotted with fresh blueberries just to reinforce the sweet-tart flavors. Whether or not you’re celebrating Christmas, these beautiful pastries are worthy for sharing at the holiday table or simply with friends and family for the sake of having a delicious sweet treat. Multiple locations within Manhattan; to find the one nearest you, click here.